Rashid and Mo (James Floyd and Fady Elsayed) are, on the one hand, the kinds of brothers parents dream of having. Rashid, being the older of the two, looks after his little brother in the tough East London neighborhood they call home. He tries to keep him in school and away from trouble with the local gangs. But when you are surrounded by drugs, guns and violence every day, it isn’t easy to avoid it altogether. This is especially difficult when the very brother that you idolize and that is trying to protect you, is also running with those same gangs. In MY BROTHER THE DEVIL, one incident triggers these brothers’ unravelling. When Rashid’s best mate, Izzy (Anthony Welsh) is shot and killed in a gang fight that Rashid is involved in, and that Mo witnesses, the reality of life sets in immediately. Rashid realizes that life isn’t a game, that when you’re dead, you’re dead. Mo meanwhile has a different reaction. The killing disturbs him but he still fights for a place in his brother’s gang just as his brother is trying to get out. While Mo struggles to find himself and emulate his brother, Rashid deals with the same internal conflict to know who he is now that he has lost his friend. He eventually finds comfort in the arms of Sayyid (Said Taghmaoui), a mutual friend of Izzy’s, and then neither brother knows who they are anymore. 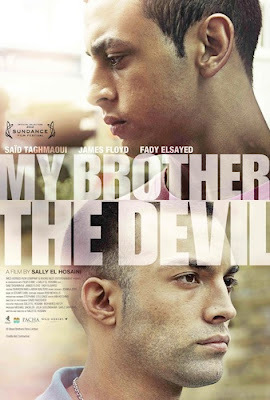 MY BROTHER THE DEVIL is Sally El Hosaini’s first feature film as a writer and director. Her biggest success before this one would be as assistant director on Paul Greengrass’s GREEN ZONE, which I despised. Fortunately, she did not take on Greengrass’s infamously shaky camera aesthetic. She demonstrates a strong sense of sensitivity toward her characters but doesn’t sacrifice any of the reality needed to make a story like this believable. And while it doesn’t bring anything necessarily new to the table, the brothers themselves are a convincing pair. Their once internal struggles become an amalgamated problem that threatens to ruin their relationship. To watch them fight to save it is moving.